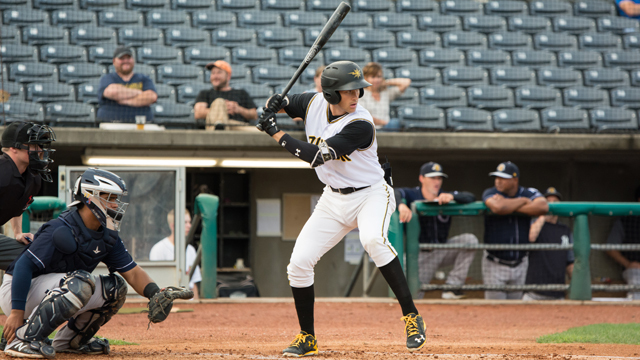 CHARLESTON, S.C. (September 3, 2018) - A four-run fifth was not enough for the Power, as the RiverDogs took home the season finale, 7-4, over West Virginia Monday afternoon at Joseph P. Riley, Jr. Park. West Virginia's loss coupled with Kannapolis' win eliminated the Power from postseason contention. West Virginia (34-33, 71-62) tallied all four of its runs in the fifth inning. Raul Hernandez and Rafelin Lorenzo started the frame with back-to-back doubles. With a 1-0 lead, Lorenzo advanced to third on a Lolo Sanchez sacrifice bunt. Travis Swaggerty then drew a walk to put runners on the corners for Connor Kaiser. On a 2-1 pitch, the Power shortstop changed the complexion of the game, charging a three-run bomb to put West Virginia in front, 4-3. Charleston (31-37, 64-72) took over in the eighth as John Pomeroy (0-1) came on to pitch. Pomeroy allowed a lead-off single to Jerry Seitz and a second hit to Oswaldo Cabrera that put runners at the corners with one out before he was removed for Beau Sulser. Sulser served up the fatal blow off the bat of Dermis Garcia, who hit two homers, one to tie the game in the sixth, and one in the eighth, a three-run homer, to give the RiverDogs the lead for good. Ryan Valdes was the first member of the bullpen to relieve Sergio Cubilete. After Cubilete offered 2.2 innings, allowing three runs, only one of which was earned, Valdes smoked his way out of the pen. The righty retired the first eight batters he faced, fanning five. He finished the day working 4.1 innings, ceding just one run on one hit, Garcia's game-tying blast in the sixth. Season ticket packages for 2019 are on sale now, which include guaranteed tickets to the 2019 South Atlantic League All-Star Game Tuesday, June 18, 2019, at Appalachian Power Park. For tickets and more information, call the Power at 304-344-2287 or visit wvpower.com.